In an area of the state known for its stunning views of sand dunes, islands and the pastel blues of Lake Michigan, Pyramid Point is one of the best. Part of the Sleeping Bear Dunes National Lakeshore, the point is a 2.6-mile trail that also traverses old farm fields and century-old beech-maple forests. But to many the trail's most unique aspect is the off-the-beaten-path location of Pyramid Point. When the famous Dune Climb is crawling with people, it's still possible to lace up a pair of hiking boots and escape the summer crowds in this corner of the park. 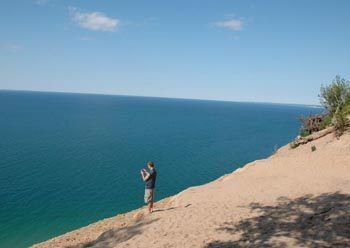 The first time I hiked Pyramid Point Trail in the 1980s I met a hang glider at the spot high above Lake Michigan known as the Lookout. We talked briefly as he finished setting up his colorful wings and then he leaped into that mass of blue that was below us. The hang gliders are long gone now but that blue panoramic that they leaped into is still there. In an area of the state known for its stunning views of sand dunes, islands and the pastel blues of Lake Michigan, Pyramid Point is one of the best. Part of the Sleeping Bear Dunes National Lakeshore, the point is a 2.6-mile trail that also traverses old farm fields and century-old beech-maple forests. But to many the trail's most unique aspect isn't habitat or hang gliders. It's the off-the-beaten-path location of Pyramid Point. When the famous Dune Climb is crawling with people, it's still possible to lace up a pair of hiking boots and escape the summer crowds in this corner of the park. The vast majority of people who do find their way to the Pyramid Point trailhead merely hike to the Lookout for the view and then return, a round-trip of only 1.2 miles with a bit of climbing at the end. Beyond that you’ll usually have the trail to yourself and in early October will be dazzled by the fall forest. Along the way a cross-over spur allows you to shorten the walk to 2 miles. The trail begins in a grassy field, the remnants of one of those 19th century farms, but quickly enters the woods and begins climbing. At Mile 0.4 you reach post No. 1 where you head left for the viewing point known as the Lookout. The final stretch is a bit steeper and At Mile 0.6 from the parking lot you breakout out of the trees on the edge of a perched dune. [On the trail at Pyramid Point.] The dune puts you 260 feet almost straight above the lapping waters of Lake Michigan which is why it attracted the hang gliders when their sport was peaking in popularity in the late 1970s. The daredevil pilots would haul their equipment to the Lookout and then use the wind currents that came up the side of the steep dune to soar for an hour or two over Lake Michigan. If they were good they could land back at their car in the parking lot. If not they would end up on the beach and be faced with an even steeper climb then the trail to the Lookout. You never see hang gliders anymore because they fly inland and where they are towed up by an airplane. The view, however, is still the same. One reason the overlook is so dramatic is because the point is the closest spot on the mainland to the Manitou Islands. You not only get an eyeful of North and South Manitou Islands but also any freighter in the area as Pyramid Point forms the south side of Manitou Passage, a popular shipping lane. From the Lookout you backtrack to post No. 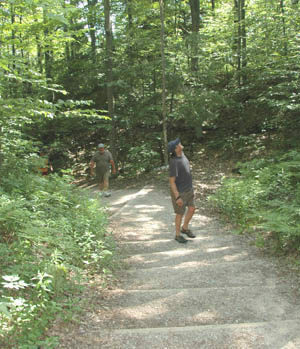 1, follow the left-hand fork and continue the descent through a beech-maple forest. After dropping 130 feet you bottom out where a migrating dune is slowly spilling its sand among the hardwoods and quickly arrive at post No. 2 at Mile1.2 from the trailhead. To the west (right) is the cross-over spur that shortens the hike to 2 miles. Head southeast (left) and another rapid drop ends in an open area created when farmers arrived here after the Civil War. The last farm was gone by the 1930s. Today the meadow is a beautiful spot, a grassy area hemmed in by forested dunes on one side and framed by birch and beech on the other. Blue standards lead you through the length of the meadow and re-direct you back into the woods at its south end. The trail now regains all the elevation lost on the previous leg. But the 0.4-mile ascent is a scenic one if the leaves have already dropped, for you can view the entire meadow along with the Lake Michigan shoreline. At post No. 3, you head west (left) for the final leg to Basch Road. This stretch holds the steepest climb of the day, with a deep ravine running along the south side of the trail. Within 0.3 mile of the last junction, you break out at the dirt road, where a post directs you to head west (right). It's a downhill walk along Basch Road for 0.4 mile to the trailhead parking area. Normally I detest any hike that ends as a road but Basch Road makes for a scenic finish. It's a narrow dirt road that winds and curves through a forest so thick that its foliage forms a canopy overhead. Even on the hottest days this is cool end to a hilly hike. At the trailhead there is a vault toilet, display board, and map box but no source of drinking water. Access to the trailhead is via Basch Road; a winding dirt road that isn't plowed during the winter in an area where snowstorms sweep across Lake Michigan. But the wildflowers abound in the spring, summer is great for climbing dunes and autumn is brilliant with the reds of maples and yellows of beech trees. Even November has its own advantages, for the fallen leaves allow additional views from ridge tops. All visitors are required to have a weekly vehicle entrance permit, an annual park pass or a per-person pass if they arrive on foot, bicycle or motorcycle. Passes can be purchased at an automated pay station at the trailhead or from the Philip Hart Visitor Center in Empire. From Glen Arbor head on M-22 for five miles to the park's Port Oneida Historic Farm District. Within this 3000-acre tract are more than a dozen farmhouses and barns that date back to the 1850s and are currently being restored by the National Park Service. When M-22 swings sharply to the east, you continue north along Port Oneida Road for 2 miles, then go east (right) on Basch Road. The dirt road climbs steadily for 0.3 mile until it levels out at the trailhead parking area. Call the Philip Hart Visitor Center (231-326-5134) or check the Sleeping Bear Dunes National Lakeshore website (www.nps.gov/slbe). 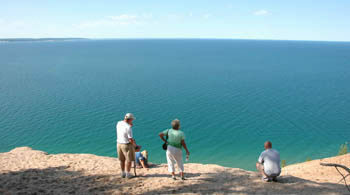 For lodging and additional travel information contact Traverse City Tourism (800-872-8377; www.traversecity.com).